This beach ranks #21 of the "Best beaches in the World"
Just near the Boulders Beach, there are several excellent guesthouses with room's rates starting from as low as US$70. However, the typical cost of the rooms in the hotels of Simon's Town is about US$150 per night. Fly to Cape Town international airport (CPT). Next hire a taxi, or take a bus, or take a train to the station of Simon's Town. 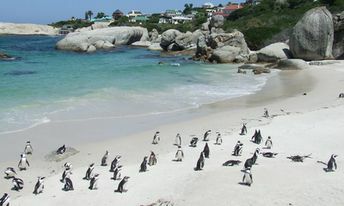 The best time for a holiday in the Boulders Beach, Cape Town, is a warm season from December to March.